Sydney tile cleaning companies that you can trust in your home. Tile is a flooring material that lasts for many years and contributes to improved indoor environment for you and your family. You can select from one of these Sydney tile cleaning companies with the confidence that they can remove dirt and grime and restore your tile floors to their original appearance. The Tile Rescue team are experts in cleaning tile and grout with over 25 years of experience. Rely on Tile Rescue for expert advice. Workmanship is guaranteed on all jobs. Tile Rescue will never use inferior methods or products that can damage tile or grout. They really know tile and can be relied upon for the solutions you need for tile or grout problems. Esteem has been providing quality work for over 23 years. They are your specialist in tile cleaning and restoration. They utilize a unique Turbo Clean System that produces its own hot water and controlled pressure to clean and then extract the dirty water away. You get amazing results. Family owned and operated since 1991, Total Care puts the WOW back in your tile and grout. Quality workmanship provided with honesty and integrity. No obligation inspections and quotations. Husband and wife team, Barry and Deborah utilise an 8 step high rotary action and advanced extraction method to remove dirt and residue left behind by other cleaners. Locally owned and operated for over 16 years. Carpet and upholstery cleaning services offered as well. ChemDry is committed to a providing a cleaning service that is drier, cleaner, and healthier. Complete packages for tile and grout. ChemDry also offers a variety of sealers to keep tiles, grout, and stone looking great longer. Using only cleaning solutions that are efficient and quick to dry, we ensure that the cleaning process is safe and environmentally friendly. Complete grout restoration and recolouring services. ChemDry uses the best and most advanced products available and does not compromise on workmanship and personalized customer service. Tile Rescue’s Sydney technician is part of Australia’s leading Tile & Grout Cleaning & Maintenance Group. They are part of a confident and passionate team of tile and grout technicians who create strong, reliable relationships with their clients. Tile Rescue has been providing smart and efficient solutions for residential and commercial properties for more than 25 years. Each Tile Rescue location is locally owned, operated, and supported by a centralised customer service office. Providing top-notch service to clients is their highest priority. From cleaning kitchen tiles in the home to commercial anti-slip tile treatments, Tile Rescue has the solutions for tile and grout you need. And No Call Out Charges! Remove loose soil frequently, dust and dirt scratch your tiles and become imbedded in the grout. Mop at least weekly. Be sure to rinse mop and water frequently. String mops work better than sponge mops. Wipe up spills immediately. 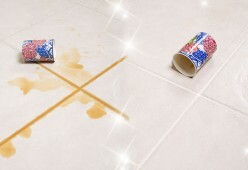 The longer a spill stays the more likely it is to stain. Dried spills attract more soil. To effectively clean grout yourself you will need a stiff brush, a strong cleaning solution, knees pads, and lots of elbow grease. There are many products marketed to clean grout and tile easily and effortlessly. They are mostly a waste of time and money. When tiles and grout are very soiled or stained, it is best to hire a professional to do the cleaning. A professional tile cleaning company will have the proper tools and surfactants to give your tile and grout a thorough cleaning. Be sure to talk to a professional about sealing your tile and grout as well. A sealant will keep your clean tile and grout looking fresh and clean for a long time to come.